 When visiting the Macomb County Clerk / Register of Deeds offices, there are many parking lots and metered spaces conveniently located nearby. Metered spaces (75 cents per hour) are located directly in front of the Court Building (40 North Main St.) and the County Building (10 North Main St.). Parking lots, including the County's parking garage, are indicated on the map below. 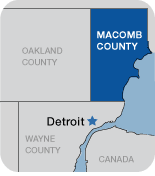 CLICK HERE for detailed directions to the Macomb County Clerk's and Register of Deeds offices. Metered spaces (75 cents per hour with a two-hour limit) are located directly in front of the Court Building (40 North Main St.). The Orange Municipal Parking Lot is located on First Street between Crocker and Dickinson with access from First Street. 10-hour metered parking spaces are available at 50 cents per hour. The "Market Street Parking Lot" is located on Market Street near Pine Street with access from Market Street. 10-hour metered parking spaces are available at 50 cents per hour. 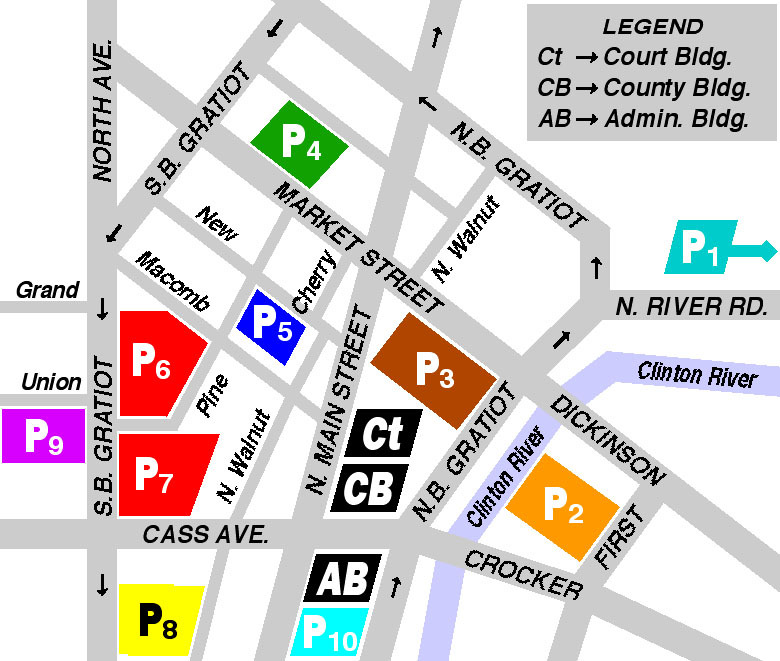 The Blue Municipal Parking Lot is located on New Street at Cherry Street with access from New Street. Two-hour metered parking spaces are available at 50 cents per hour. Two large "ROSKOPP" Municipal Parking Lots are located on either side of Pine Street at Southbound Gratiot with access from Pine Street, Macomb Place and Southbound Gratiot. 10-hour and three-hour metered parking spaces are available at 50 cents per hour. "The "Business District Parking Lot" is located along Southbound Gratiot near Cass Avenue with access from Southbound Gratiot. 10-hour metered parking spaces are available at 50 cents per hour. The "Union Street Parking Lot" is located at the corner of Union Street and Southbound Gratiot with access from Southbound Gratiot. 10-hour metered parking spaces are available at 50 cents per hour.